Do you need a gift for someone special and are not sure what to give? A Reads Gift Certificate is perfect. With a great selection of contemporary women's clothing, shoes and accessories a Gift Certificate is a simple but thoughtful gift and will be well received.Gift certificates are issued for in store use only, however the recipient can contact us to arrange their use online. 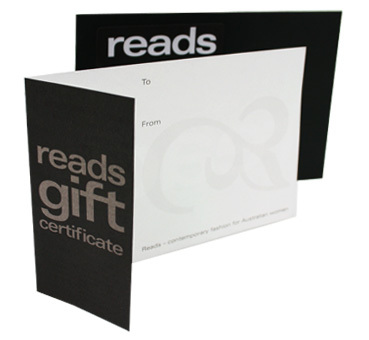 To purchase a Reads Gift Certificate call us on +61 2 9328 1036 and we will process a Gift Certificate and forward it to the gift recipient or your address. Prefer to purchase a special item? If you wish to choose something personally as a gift for someone, you may purchase something online and have it delivered directly to them with a gift message. If purchasing a gift online, simply complete your order as if shopping for yourself. On completion of the order you will be able to add your recipient's address. When a Gift Certificate is presented in store, if the total amount is not redeemed an in store credit for the remaining balance will be issued. Lost or stolen Gift Certificates cannot be refunded or replaced.